They came for their friends, their community and for themselves; they were there for people like Brian Fairbrass (Benny), who committed suicide having been diagnosed with pleural plaques and for Peter Braddock, whose pleural plaques have been superseded by asbestos cancer. 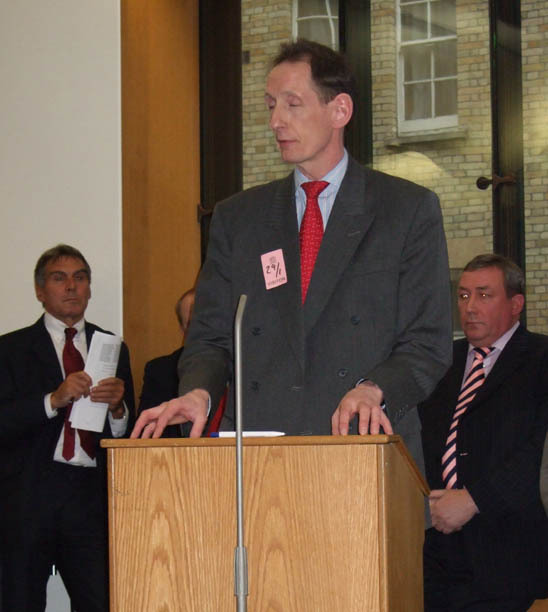 The demonstration and Parliamentary rally in Westminster was over a defendants' decision by the House of Lords (October 2007; see British Asbestos Newsletter Issue 69) on the Rothwell case, a conjoined appeal over the issue of pleural plaque compensation. The Law Lords' decision signalled the end of UK pleural plaque compensation and reversed more than 20 years of precedents during which compensation for this condition was routinely awarded by the courts. 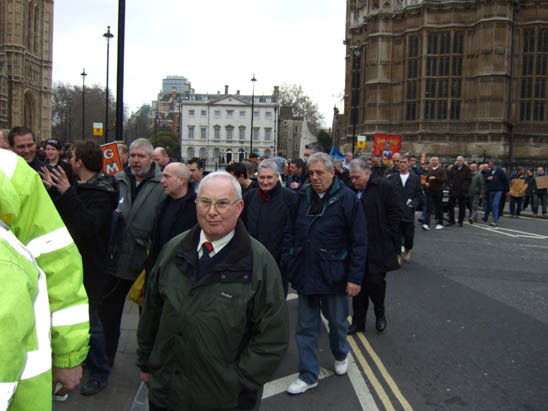 The events on January 29, 2008 were supported by the a cross-section of UK trade unions including the GMB, UCATT, the T&G and Unite, formerly Amicus. Asbestos victim support groups from Manchester, Sheffield, Hampshire, Cheshire, Liverpool, Derbyshire and Glasgow, and activists from all over the country were also out in force. Amongst the protestors, frustration had given way to anger at the betrayal by a government and judicial system which was out of touch with the reality of ordinary men and women. For the first time in a long time, so one MP said, the Attlee Suite was the venue for a meeting dominated by an issue of class, the working class. How can someone's body sustain pathological tissue change and the individual not be injured? This is not a matter of legal analysis; it is an emotional issue for a whole segment of society. People with pleural plaques are not the worried well, said the eminent medical specialist Dr. Robin Rudd. Twenty-three of the branch members had died from their illnesses. 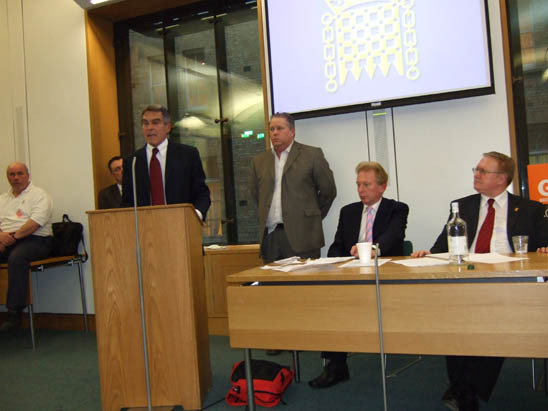 Overwhelming support for Parliamentary action to reverse this iniquitous decision was evinced by the trade union general secretaries in attendance and scores of MPs who agreed that it was likely the Parliament in Holyrod would act to restore compensation for plaque sufferers in Scotland. When this happens, it would create a north-south, post-code lottery in which some would continue to be deprived of their rightful due. This was unthinkable. A political strategy for the coming months was outlined by MP Michael Clapham who stressed the need for trade unionists and asbestos victims to continue the pressure on their elected representatives. 1 MPs in attendance included: Michael Clapham, Doug Henderson, Charlotte Atkins, Ian McCarthy, John McFall, Kevin Baron, John Battle, Jimmy McGovern, Iain Wright, John Robertson, Ann Cryer, Frank Doran, Tony Lloyd, Dennis Skinner, Doug Naysmith, Jon Cruddas, Julia Goldsworthy, Kevin Jones, Stephen Hepburn, Ian Gibson, Nick Brown, Peter Kilfoyle, Kelvin Hopkins, Gordon Marsden, Alison Seabeck, Nigel Griffiths, Celia Barlow, Jon Trickett, Dave Anderson.